I showed you a pic of the front of the Daniels Faculty of Architecture, Landscape and Design a few weeks ago HERE. Well the building was open for our Doors Open event so I did a tour of the interior. 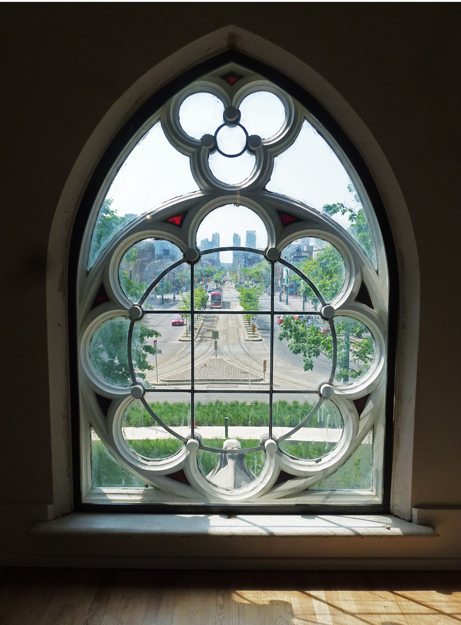 This pic was taken looking out through the window above the door in the centre of the building giving us a view down Spadina Ave right down to Lake Ontario. You can see one of our red streetcars stopped if you look through the middle of the window. I'll have a few more pics of the interior over the next days. Beautifully framed photo. Fine looking window. What a fantastic view framed by that fabulously ornate window. I can't wait to see more. A beautiful window and a beautiful view ! Now, once again I'm wondering if you have any professional connection to architecture. This window takes my breath away and the composition of the shot is so excellent, looking down the street toward the lake. Yes, I can see one of those wonderful red streetcars. Kudos to you! Good shot Pat. The exposure is perfect. Hello, I love the window and the pretty view. Happy Thursday, Enjoy your day! Really love the way that you composed this shot, and the red streetcar adds to the detail. Love the window and the view! I love this photo, Pat! Beautiful, I like shots like this! I am a sucker for lovely traditional architecture like this. Nice view into the city.